Vianez Morales has some amazing videos and shots on her Instagram. The link will take you to a video and the picture above is one where I just love, love, love the outfit.
. . . The more black, ripped and worn out clothing you have, the better you’re going to look . . .
Well maybe black, ripped, and worn out clothing looks good on you – wear it skateboarding – my point is there is NO skateboard uniform. 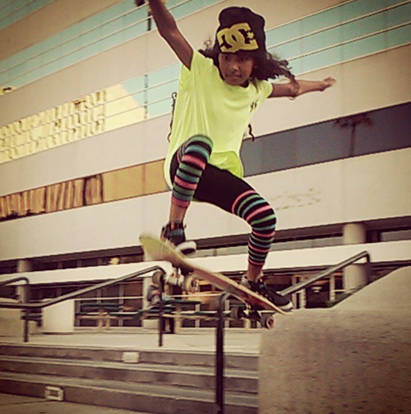 You don’t have to be dressed in black, Vianez is shredding in yellow – some might even say neon yellow – she looks fabulous and inspires me to keep skateboarding. Keep sharing your pictures – the more people see the more they know stereotypes about skateboarders are just stories.